Bridges and dentures can replace a missing tooth, but they don't offer the benefits that dental implants do. Mark E. Richardson, D.D.S., your Kalamazoo, MI, dentist, is here to explain how dental implants work and the advantages of implants. Dental implants consist of three parts: the titanium implant, the crown and the abutment, a piece that connects the crown to the implant. The titanium implant looks like a screw and is placed in your jawbone. Over the course of several months, it bonds to your jawbone. Once bonding occurs, your Kalamazoo dentist connects the abutment to the crown, which will replace your tooth above the gum line. Just as your roots anchor your tooth in your jaw, your dental implant anchors the crown that sits on top of it. 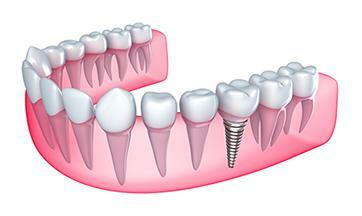 The titanium implant provides a stable foundation for the crown because it actually fuses to the bone in your jaw. When you bite into an apple with a dental implant, your new tooth won't move or slip. Over time, the fit of dentures can change, which can result in slippage and gum irritation when you bite and chew. Implants offer the ultimate in comfort because they feel like the tooth you lost. At first glance, dental implants may seem more expensive than bridges or dentures, but it's important to consider the lifetime costs of each option. Because implants bond to your jawbone, you'll probably never have to replace them. Bridges or dentures usually must be replaced several times throughout the years. When you compare the lifetime costs, you'll probably discover the implants are the better option. Tooth loss can cause your jawbone to weaken and recede. Your tooth roots provide the constant stimulation your jaw needs to remain strong and healthy. When you lose a tooth, that area of your jawbone no longer receives stimulation. Dental implants offer the perfect way to restore your smile and keep your jawbone strong. When there's a noticeable gap in your smile, it's hard to feel confident about your appearance. Unfortunately, if you wait too long to replace your tooth, your other teeth may begin to overlap as they drift toward the gap. Soon, you'll not only have to worry about a missing tooth, but also about crooked teeth. Implants restore your confidence and help you keep nearby teeth straight. Ready to replace missing teeth with dental implants? Call Mark E. Richardson, D.D.S., your Kalamazoo, MI, dentist, at (269) 343-6907 to make an appointment. Restore your smile with dental implants.